So SSX is out. It got good reviews. Tenley and I, separately, LOVED SSX Tricky for the PS2. 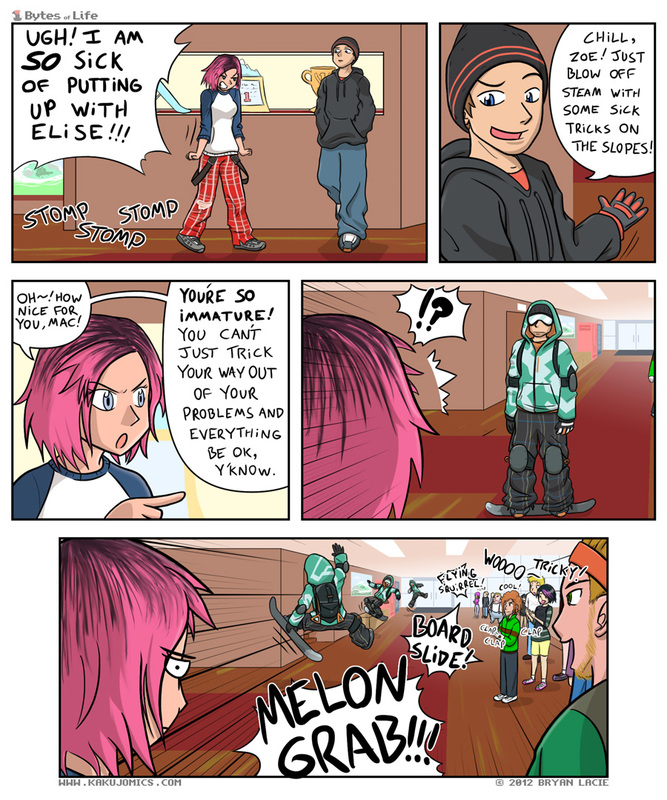 When it came time to select what comic to draw, she insisted I do one for SSX. So there. It was a decent change of pace, both in topic and style, at any rate. Tools Used: Photoshop, Wacom Intuos4 Tablet (Large), Firefox and iTunes. It might be a while before I do another timelapse. This one almost made my computer explode, and I need to pinpoint the bottleneck, first (so far, it seems to be my hard drive). So, again, SSX is out. I don’t have it, but MY. GLOB. I want it. Revisiting EarthBound/Mother 2 and Spanky’s Quest has been very interesting. I have a pretty bad memory of my childhood, and only remember very specific things about the games, so I really feel like I’m experiencing a good portion of it for the first time. It’s awesome. Lily got a stomach bug, this weekend. She wouldn’t stop throwing up, so we had to take her to the ER for some meds; she got better the day after. Then, Monday morning, TENLEY got the stomach bug, so I had to watch Lily another day and got all kinds of behind on things. So hopefully the stomach bug will find a horrible demise, because I hate it. Everyone’s good now, granted, but I’ve been playing catch-up ever since (note that I’m writing this at 5am). I’m getting closer and closer to getting one out every week, like the old days (a year ago). My stamina for drawing is slowly increasing, as a result of me actually getting off my rump and exercising/working out every morning, so maybe updating weekly isn’t the fevered dream of a guy with a family and 2.5 jobs? That’s amazing. I might use that slogan, y’know. Eh, thanks for the concern, but I’ll be fine. 🙂 I used to update weekly, and I’d really like to get back to that. Or at LEAST something that isn’t 1-3 months. Great job on the new comic, pretty fast and did not expect this one… Usually I’d comment on more often (since I downloaded these fun apps on my Itouch). Other than that keep up the good work and be waiting for the next comic. Haha! Racing was never my favorite. Getting the trick high-scores was always my thing. Ha! I love this comic. I wish I could do this to get out of any situation. Thanks! It would be nice. And stylish!